Popularity of the first women phone from Samsung – A400 induced the company to continue their developments in this field and the next attempt was the Samsung T500. First thing, which you pay attention to, when see this model is a decorated external display. Thanks to them the phone is transformed into jewellery. About 32 imitation stones are located around the display. Someone says that these stones are made of plastic. But they are mistaken, as stones are produced by Signity – a branch company of Swarowski. Plastic is not used in this phone, otherwise these stones won’t glitter so much. We think that they are similar to those ones, which are applied in Swarowski’s production. Originally, they are called Signity Star Cubic Zirconia. There is even a respective certificate, which quarantines originality of stones. These stones don’t only play a role of gems; they serve as a service indicator as well. You could select any color you like: green, blue, orange, blue, red and some others. All stones are blinked. So, there is a possibility to personalize the phone. This indication is rather nice and makes the phone more attractive. Traditionally the phone is available in several colors. For example, one can find handsets of red, blue and white color on the market today. The cover is lacquered, not mat. But exterior won’t become dirty very quickly. A microfibre, which is included in the kit is necessary to clean a display, not a cover. Phones of all colors have a silver insertion, which is positioned on the sides of the phone. Visible part of external antenna and a top side of the phone is also silver. 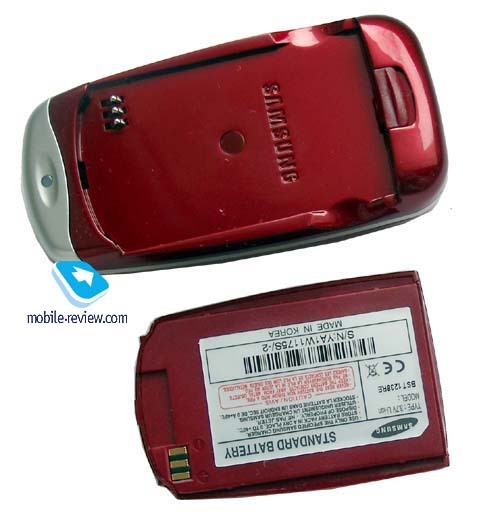 T500 has compact dimensions (76x44x23 mm), it is comparable with any modern phone of this segment. Girls can wear it both in the handbag and around the neck. A stripe, which combined with a portable handsfree, is rather convenient. The phone is lightweight (80 grams). 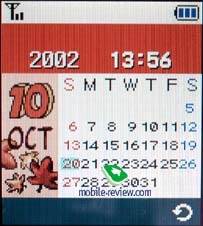 An external non-color screen can display several lines of information, but the phone looks nicer when analogue clock are displayed on the screen. An external screen has a pastel blue backlighting. 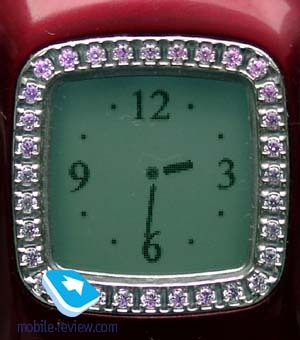 A double volume key is placed on the phone’s side. A portable handsfree connector is positioned under it. A system connector is located on the bottom of the phone. If we open the handset, we’ll see an internal TFT-display, which can display up to 65000 colors. The picture is bright and vivid. 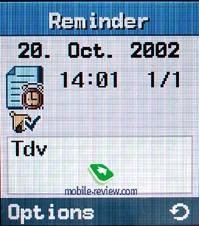 Up to 5 text lines, title and tips to the soft-keys use can be displayed on the screen, which has a resolution of 128х160 pixels. The information is visible in all lighting conditions. 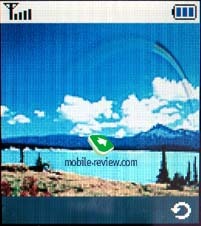 Today it is one of the best screens, most top models from Samsung are equipped with the same ones. A peculiarity of the women phone is that when you press C key an internal display is transformed into a mirror. The same transformation occurs when one turns off a backlighting. My girlfriend states that this mirror can’t substitute mirrors of compact powders, but it is very helpful when you have a small bag. It can be used as a reserved mirror. Keypad is made of plastic. All keys are large and well-spaced, they are very comfortable to use even if you have long nails. Keys have a blue backlighting, but characters are seen not in all lighting conditions, sometimes they are blended. Now few words about the battery. Both batteries, which are included in the standard kit, are lithium-ion batteries of 720 mAh capacity. According to the manufacturer the phone could operate up to 3 hours in talking mode and up to 200 hours in standby mode. Those, who have used A400, remember that the phone could work only one day and then it was necessary to re-charge it. T500 could work about 2 days and a half without re-charging in case of 30 minutes of talking. So, operating time of the phone is about 1-3days, depending on the phone using activity. In case of 10 minutes a day the handset worked about 3 days. 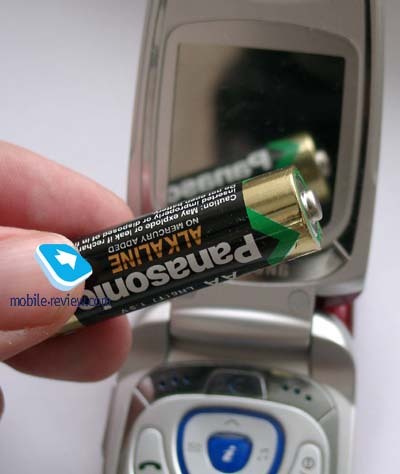 The second battery enables to charge the phone not so often. Time of full re-charging is about 1.5 hours. Traditional menu structure is applied here. Under the title of the main items, one could see list of menu items. There is a shortcut number navigation, which is available only within one menu. You can’t quickly move to other main menus and it’s not very comfortable. On the other hand, the menu of this phone has a logical structure and you don’t need much time to call one or another feature. Wallpapers with flowers and similar views indicate that the handset is aimed to ladies. Phonebook. On the one hand, the phonebook is very simple, only one number is associated to one name, but on the other hand, the interface of this phonebook is very attractive. Up to 500 names can be stored in the phone memory, the memory of SIM-card is also available. 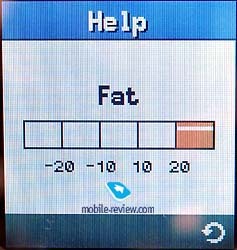 You can select a personal ringing tone, set a voice tag (up to 18) and select a color of the backlighting. The phone repeats the tag three times before it records the tag. The identical tags can't be saved. Call records. Here you can store traditional call lists, each of them consists of 15 phone numbers. Besides, you can view the duration of dialed and received calls. When you press the send key you can see a joint list of calls with the indication if their types (received and sent). 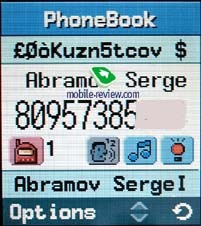 If you have number, which is stored in the phonebook, you couldn’t view it (only name is displayed). To do it you should call a saving menu. If you dial one phone number several times, it will be saved in different cells as different phone numbers in a list. It is a small shortcoming of this phone. Messages. This item gives an access to the settings connected with SMS messages. These messages can be kept only in SIM-card memory. When it is full, you'll see an icon of blinking envelope. To receive a new message you should delete some of the old messages. 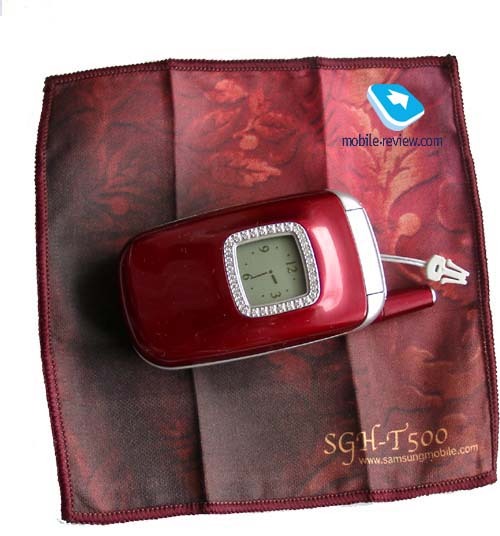 SGH-T500 supports Nokia Smart Messaging (not EMS), what allows to send pictures and melodies to all new phones produced by Samsung and almost any phone from Nokia. 10 pre-default original pictures (in black-and-white) are set here. Also you can make up to 5 templates (they are empty by default). Furthermore, you can set special options to receive broadcast messages. Voice Functions. Here you can view, edit or delete voice tags and command tags (up to 19). Menu items, which can be voice dialed, are included in one list. The phone has a voice memo feature, which allows to save 3 records (35 seconds each), but it works only in standby mode. Tones. All settings connected with the melodies are collected in this menu. For example, you can select one of the 37 polyphonic ringing tones, one of 4 tones and the singing of birds. You can download up to 3 melodies from the Internet or create two melodies in the music composer. Type of incoming alert (vibrating call, ringing tone, vibrating call + ringing tone) can be set here too. When mixed mode is setup, first, the vibracall works 3 times and after that you can hear a ringing tone. You can choose one of 5 tones for SMS messages, which are different from the ringing tones. Settings. We are not going to tell about all settings in the phone, only about the most interesting. 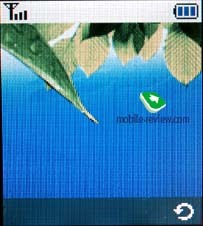 Firstly, you can activate a voice dial or a voice access to the menu while opening the phone. Secondly, you can set one of the 5 animated screen savers. 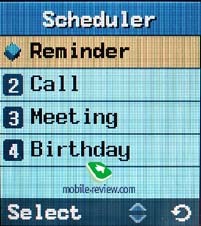 What is more interesting and very convenient, the calendar with all notes can be used as a screensaver. Finally, there is one empty slot for the image, which the user can download himself. Organizer. You can set different types of events and reminders here. The organizer has a monthly view, the day with events are underlined. Only one event with a description can be displayed on the screen, short list is not available. 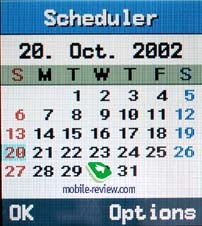 There is a separate item - Calendar, which shows the current day and the month. In my opinion the main sense of this feature is not to show days with events to other people. You can also use a to-do list, select a priority (low or high), sort all notes and mark those, which are done. Everything is very convenient. 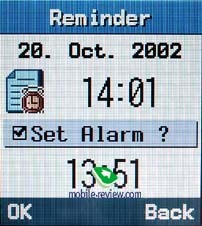 The alarm clock, which works even when the phone is switched off, can ring once, daily or weekly. One of 4 new tones can be chosen for the alarm-clock. The world time function is simply realized, on the contrary, the calculator is really handy. Life. All games and special women menus are located here. 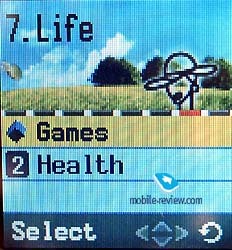 There are 3 pre-installed games in the phone (Bowling, HamsterBox, HoneyBall). Your motion in the first one is to open a picture, avoiding flying animals. The last one is a version of arkanoid, but the racket is very slow, what is irriatating. Health. All features and errors remained the same in this menu. There are no differences with A400 here. 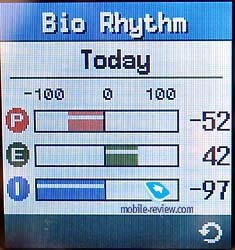 First item is Biorhythm. You can receive all information about your emotional, physical and intellectual potential here. To do it, input a date of your birthday and select a day, which you’d like to see the results for. The results are shown as a diagram (absolute values; -100 - 100). The title of the second item is overweight. The method of weight counting is very primitive. Only such parameters as gender and height are taken into account, and other features, for example, age, professional sport and others are not important. The results are really very strange. So, if you have a height 178 cm and weight 70 kg, then, according to this counter, you have 5 kg of overweight. But if, for example, you input the same height (178 cm) and weight 65 kg, then you have 2 kg of short weight. So, first, you should thin down (5 kg) and then put on the weight (2 kg). 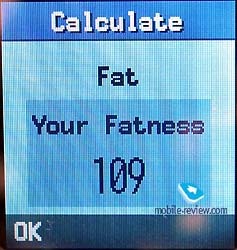 When the phone gives you information about your weight, it automatically defines your constitution. Totally, there are 5 gradations. Normal people are those, weight of whom is not more than 10 kg compared to standard. Next item is Calories. 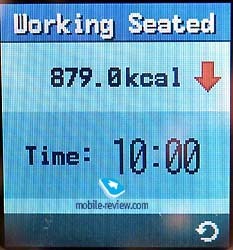 It allows to estimate number of calories which are wasted by a human during one day. It takes into account several parameters, including household work (cooking, cleaning, washing up), gardening, taking a bath, reading, sport (swimming, tennis, dances and etc) and even telephone talking. 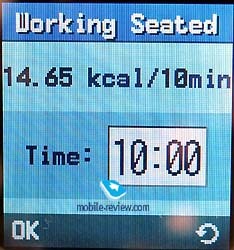 However, how much calories you waste, working, for example, with computer is not known, though it is a very popular way of spending time today. The last menu is Biocycle or Pink schedule. If you input a day of the last biocycle and its duration, you could count an ovulation date and a presumable date of the next biocycle. 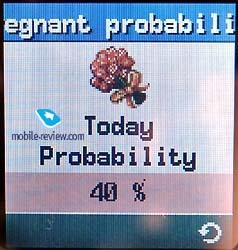 Also you could receive information, concerning pregnancy probability for any day you like. This method could work correctly only within one biocycle. 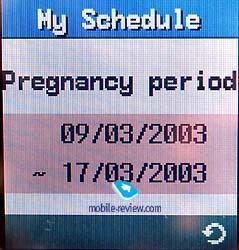 For example, if on the 20. of March 2003 you’ll record that the date of the last biocycle was 20 December 2002 and an average duration of the biocycle is 30 days, pregnancy probability of this day (20.03.2003 – after three months) will be only 10%, not 90% or 110%. All similar calculation you could make for your friend too. WWW Services. A usual wap-browser in version 1.2.1, which offers standard possibilities, is kept here. This women phone is based on T400, if you decide to compare their features, the only difference you’ll find will be an added item – Health. A sound quality and reception quality is very high. Vibrating alert is average, volume of the ringtones is high, but it is a little bit lower compared to T400. This phone will be popular, firstly, because of the design. Besides, it has almost all features, which are necessary to modern girls: polyphony, color screen, individual design and sufficient operating time. So, it is an ideal solution for ladies. We think that Samsung will succeed with a new women phone. Price of this handset is about 400-450 USD.